I’m not going to the vigil. 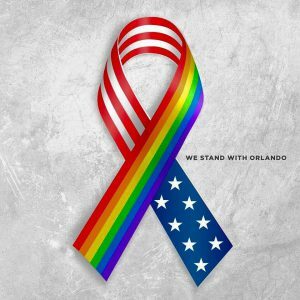 Actually there are (at least) two vigils in Paris tonight for the victims of the Orlando massacre. One, sponsored by gay community organizations, is being held at Trocadero, across the river from the Eiffel Tower, and the other at the American Cathedral in Paris, where I am a member. Many others, of course, are coming together in the wake of the massacre. The City of Paris tweeted the accompanying image, noting that “Love wins”. Omnia vincit amor. I greatly appreciate the gestures of the Cathedral and the City of Paris. It shows that we are, in fact, family. It’s not “us” against “them” — Christian vs. Muslim, gay vs. straight, or any of the walls that the fearful would build. We are, quite literally, all in this together. I was disheartened — though not surprised — to see the Republicans trying to make a massacre into a political issue. I have refrained from most writing about the coming presidential election in the United States, though I will have more to say on that soon. In the meantime, vigils and prayers seem appropriate to me. Sometimes I despair over the culture I was born into. American political discourse continues to sink into the muck. The presumptive Republican candidate is the lowest of the low. Yet I remain hopeful. Americans have never chosen a demagogue as president. No military coup has taken place. I am tempted, as usual, to qualify those sentences with a “yet”. But American democracy remains robust, even if the two parties have shifted to the right over the past thirty years. Today, I met a friend over coffee (his, not mine, it’s Ramadan). He remarked that perhaps the greatest achievement of the Obama era has been the advancement of LGBT rights. It’s heartening to hear this from a straight man. And he, like I, saw the Orlando massacre as essentially homophobic, even if intended as an act of terrorism. It matters little. The dead in Paris, Brussels and Orlando are still dead. A friend wrote on my Facebook page that prayers aren’t enough, action is needed. And if this massacre results in something blindingly simple and obvious, like barring the sale of automatic weapons, that would be a good thing. But for me, it’s too soon to think clearly about “what to do”. As another friend once told me, don’t just do something, stand there. And so I stand in solidarity with the victims and their loved ones, not at Trocadero or the American Cathedral, but in my home. I shall march another day.